In early May 1930 Dr. E. H. McCleery, having established and operated a successful "Wolf Farm" near Kane, Pennsylvania for the previous ten years, established a secondary wolf park along the Lincoln Highway (Route 30) two miles east of Gap and nine miles west of Coatesville in Salisbury Township, Pennsylvania. The park was often referred to as the "Coatesville Park" despite being much closer to Gap. It was located just west of the Lancaster county line bordering Chester county. At least one of the remaining wolves was spared however. A local man, Israel Green, had a tame pet wolf in the 1930s which he probably obtained from the wolf park when it closed.12 Marie Mosbey Congo, who was born in 1927 and lived on Zion Hill,13 remembers her neighbor Israel taking the wolf (whose name was either "Wolf" or "Wolfie") for walks, and feeding it out of an old, banged up dishpan. When the wolf died of old age, Israel buried the wolf and held a funeral for it. Marie Mosbey Congo, Marie's father, and another neighborhood boy named John States were among the funeral attendees. Marie brought flowers from her father's garden which she laid at the wolf's grave. Despite his initial plans, Dr. McCleery did not establish any additional wolf parks after the Gap park. 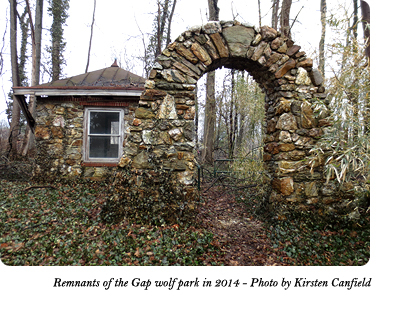 Judging by the fact that the Gap park's closure was not written about for several decades,14 and that no further wolf parks were established, I imagine Dr. McCleery felt badly about how the Gap park ended and didn't want to risk that happening again. It is curious that Dr. McCleery chose Gap as a wolf park location over the other large cities which offered him land and assistance with promotion. I believe that one factor in this decision may have been Martin T. Carroll's willingness to move to the area to be closer to his oldest daughter and grandchild, who lived in Haverford. Dr. McCleery was very particular about the care of his wolves and probably preferred to entrust their management to a close friend, which I believe Martin was to Dr. McCleery. Additionally, it is possible that someone in the Gap area (possibly Michael Stern) expressed interest in establishing a wolf park there and may have donated resources. Many wonderful people contributed information to this article, but I would like to specifically acknowledge Nancy Plumley of Hershey's Azalea Farm for her immeasurable help in tracking down information and contacts to help piece this story together. 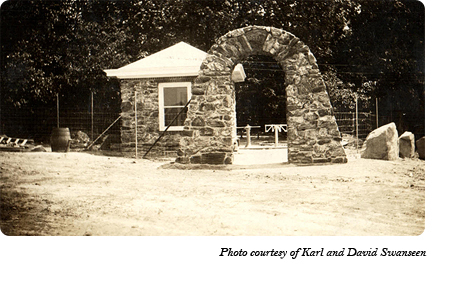 1In the 1950s, the Koropsak family owned the land that once housed the wolf park. I traced the ownership of this family's plot of land back to the time when the wolf park was in business, and it seems to have been owned by Michael Stern between 1929 and 1934. There are no records of Dr. McCleery or any of his associates buying or selling land in Lancaster county around that time; I searched extensively in the Lancaster Recorder of Deeds archive, and the Lancaster County archivist also searched, but we found nothing. Vernon Fisher (who was born in 1936 and grew up in Gap) remembers his mother saying that the wolves used to be located "up on Mike's stone hill," which is what she always called the area up around where the Koropsak family lived. Therefore I believe that Dr. McCleery might have rented the land from Michael Stern. 2Information courtesy of David and Karl Swanseen, nephews of Eric "Rick" Swanseen. 3According to land records available through the Lancaster Recorder of Deeds archive, Eric "Rick" Swanseen purchased land in Gap in 1935 from his father-in-law Michael Stern. 4According to Martin T. Carroll's 1910 census record he was an oil worker, and according to his 1930 census record he was not working. 5According to the 1930 census, Martin and Marion Carroll had been living together in Kane. According to Martin's 1933 death certificate, both he and Marion (the informant of his death) were living in Gap. Neither I nor the Lancaster County archivist could find any records of any Carrolls buying or selling land in Gap around that time, and since the Carrolls rented their residences in 1910 and 1920 according to the census, I believe they rented again in Gap. 6Information courtesy of Ray Stern, son of George Stern. The ages and occupations of the two keepers are from the 1930 census. 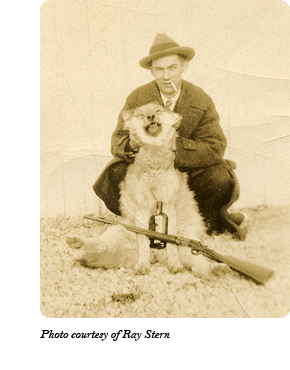 The possibility of meat for the wolves being obtained from the Hanna family's butcher shop is purely speculation (The butcher shop seems to have closed prior to 1940 according to census data, though the exact date is unknown. It is possible that the closure of the butcher shop may have been related to the closure of the wolf park). According to Nancy Plumley, around 1930 a stretch of Route 30 between the county line and Gap was being repaved, so Maurice Hanna was probably working there. If that was the case, he would have been familiar with the wolf park. 7Information from the back of the advertising card contributed by Nancy Plumley. 8Information courtesy of Ray Stern, whose father George Stern told him these stories. 9Information courtesy of Vince Eby and Bill Kauffman. 10This conclusion is based on two main findings. 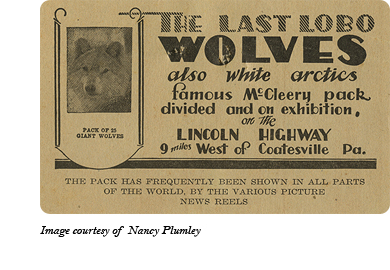 Firstly, during the first two years of the Gap park's operation (1930 and 1931) Dr. McCleery's secondary wolf park was mentioned in many publications about the wolves. 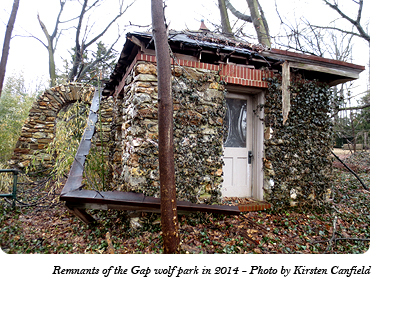 The last mention I have found of the Gap wolf park was on November 21, 1931.114 The absence of any further mention of a second park, when it had previously been so often referred to, indicates its closure around that time. Secondly, according to Ray Stern, his father George Stern was living in the Gap area when the wolf park closed (this is confirmed by his appearance in one of the photos with a dead wolf). George Stern sold his property in Gap in December 1931 and moved to Philadelphia, which would indicate that the wolf park closed during or before December 1931. Additionally, the men in the photos with the dead wolf are wearing warmer clothes, suggesting that the wolf park closed during a colder time of year. 11Information courtesy of Ray Stern, whose father George Stern told him these stories about the shooting of the wolves. Prohibition was still law in 1931, but according to Wanda Smale of the Salisbury Township Historical Society, stills and bootleg whiskey were definitely in the area during Prohibition. Although the presence of a label on bootleg whiskey might not have been the norm, the way the whiskey was displayed as a centerpiece of the photos suggests that its presence was unusual. 12The story of Israel Green's wolf is courtesy of Marie Mosbey Congo, who remembers the wolf from when she was a young girl. 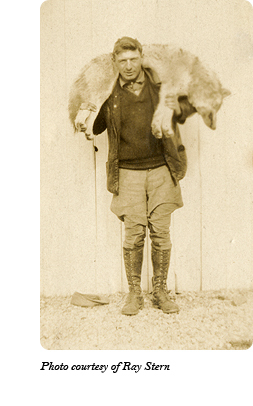 I am fairly certain that this wolf came from Dr. McCleery's Gap wolf park; there was no other feasible place or situation in which a poor man from Gap could have obtained a wolf as a pet in the 1930s. 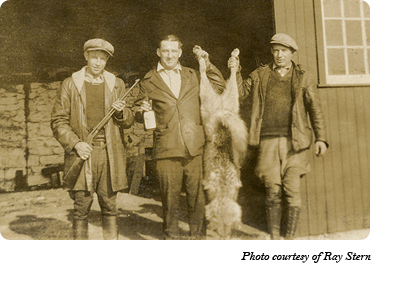 Wolves were expensive exotic pets, and in the 1920s, Dr. McCleery sold wolf pups for around $50 to $75 each. According to Marie, Israel definitely did not have that kind of money and certainly could not have purchased the wolf. However, the desperate situation at the end of the park created a situation in which Israel may have bartered or done work in exchange for a wolf, or may simply have requested a wolf and was given one. 13Zion Hill is located between the towns of Christiana and Atglen, and is about three miles south of Gap. Although it has an Atglen address, Zion Hill is a distinct little community which was a totally black settlement in the 1930s. 14After November 21, 1931114 it was at least two decades before the Gap park was mentioned again in writing, as far as I have found. Gap locals who remember people who knew about the park's end describe those people as reluctant to talk about the park, and as a result, there are few local stories about it. Find out more about the Gap park by exploring the Locations - Coatesville, PA tag in the archive. 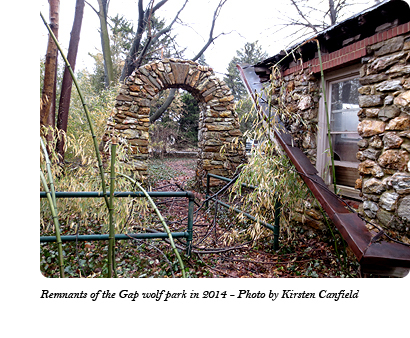 See photos of the Gap, PA wolf park here. If you have any information about Dr. McCleery's wolf park between Gap and Coatesville, including information about or photos of Martin T. Carroll, Marion Carroll, Michael Stern, George Stern, Maurice Hanna, William Hanna, or Israel Green, I would very much appreciate hearing from you.